After spending the weekend of cleaning up after Hurricane Sandy, I wanted to eat something that was filling, fried, and quick to prepare. I mean, what is better (and more comforting) than freshly fried potatoes on a cold day?! Nada! Since I’m “trying” to cut back on calories I decided to fry up some sweet potatoes instead of regular taters. That way, I would trick my conscious into thinking I was eating something healthy. Score! So, my dad helped me find the shredding attachment for our food processor (no idea where the box grater is) and I got to shreddin’! Halfway through I realized I was making sweet potato latkes, and thus this recipe was born. Each beautiful little piece of sweet potato get tossed with sliced onions and a simple spice mixture of garlic, cinnamon, and cayenne. 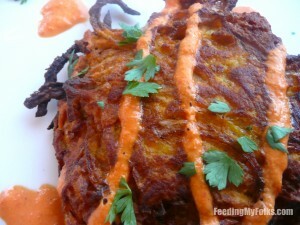 Add a couple of eggs, a dusting of flour, and you got yourself a latke! Potatoes frying in oil smell amazing…totally makes me drool at every whiff. It’s hard to resist reaching into the pan to snap off a crusty bite…but don’t worry, I patiently waited for them to finish cooking. 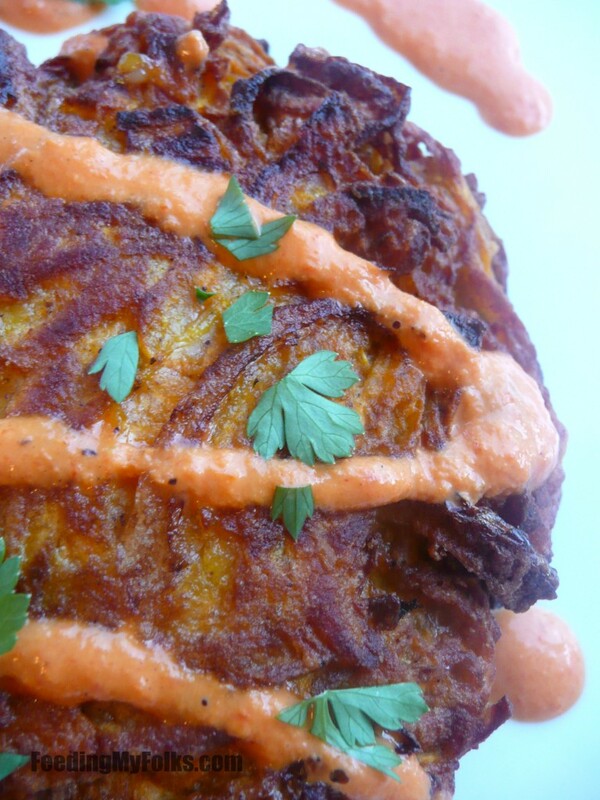 While the latkes are doing their thang in the pan, I whip up a super simple dipping sauce made with roasted red peppers, garlic, hot sauce, and ranch dressing. Its creamy and zesty and seriously might become your new favorite condiment. 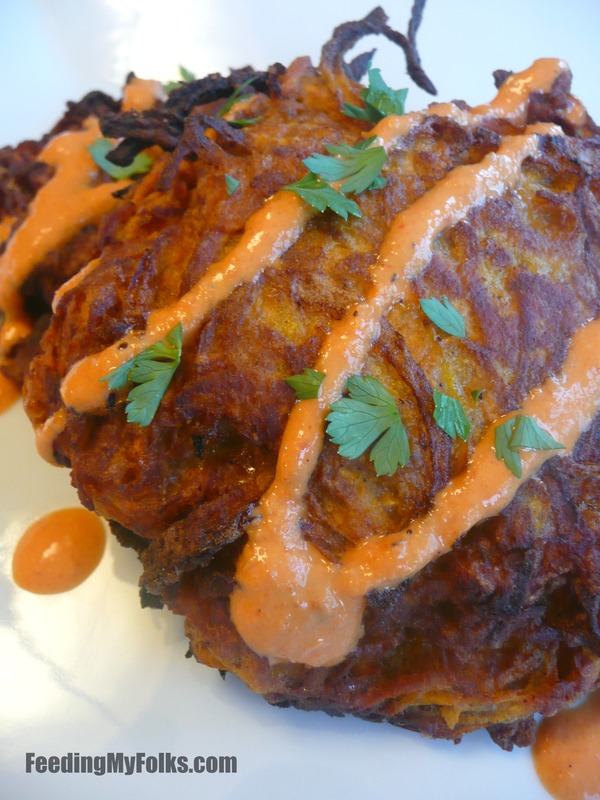 Drizzle the sauce over the latkes, but keep a little on the side for dipping. You’ll know why after you take a bite. So freakin’ good! Using a food processor or box grater, shred the sweet potatoes. Toss with other ingredients until thoroughly combined and then form into 5 patties. Warm oil over medium-high heat in a large skillet. Carefully add each patty to the oil and fry 1 1/2 to 2 minutes on each side. Remove oil and place onto a paper towel so the excess oil can drain off. Serve warm or hot with the dipping sauce (recipe below). Enjoy!